The Center for Energy, Environment & Sustainability has a small dedicated staff. 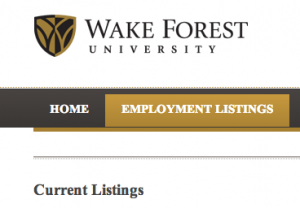 Those interested in joining our team should check the Wake Forest University career portal for job listings. The Environmental Program and the Department of Biology at Wake Forest University invite applicants for a Teacher-Scholar Postdoctoral Fellow in the Earth Sciences position. We seek a teacher-scholar who is trained in a discipline within the Earth Sciences as broadly defined, and who has a strong commitment to engaging students both in the classroom and through research mentorship at the undergraduate, MS, and PhD levels. The successful candidate will teach four courses per year with two courses each in spring and fall semesters. Courses include an introductory earth sciences course, with opportunities to develop additional courses in their area of interest. A goal of the position is to strengthen the Environmental Studies Program at Wake Forest while allowing the candidate to continue to pursue his or her research. Review of applications is underway and will continue until the position is filled. The submission of an online application is required for this position. Questions regarding the position may be addressed to stottlem@wfu.edu. Questions about the application process may be addressed to wakejobs@wfu.edu.